Okay, I'll admit that the previous blog post wasn't that informative, so this time I'll try to give more info, and less blah blah. As you can see, the timer, kart positions, minimap and lap counter have been added, as well as FPS reporting and countdown at start, and so forth. Another thing is the boxy and ugly look of the track. This is because karts/tracks/objects now need to be exported with normals included in order to get proper smoothing, which most stuff doesn't have at the moment. So for all modelers wanting to create for 0.7 and beyond: export everything with the normals included in your b3d file - if you have questions about this, please look at the wiki pages or ask at the forums. 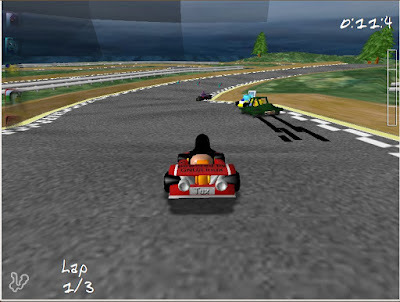 Also, xapantu has made a kart exporter for the Irrlicht version of SuperTuxKart, which can be found in this forum thread, together with details on how it works. Lastly, but not leastly, we have got some help with the plunger and cake by david, making them easier to use with success in the game. Now it might seem that SuperTuxKart got more than enough contributors, but that just isn't the case - there are only two main contributors at the moment (maybe more in some time), so we are always looking for more programmers, modelers, musicians, donators or simply useful feedback. "we are always looking for more programmers" => I'm waiting the irrlicht port is complete before start contributing. You might want to consider adding a homing bomb. mcmic: Totally agreed; to pick up a cake almost seemed like waste of time.